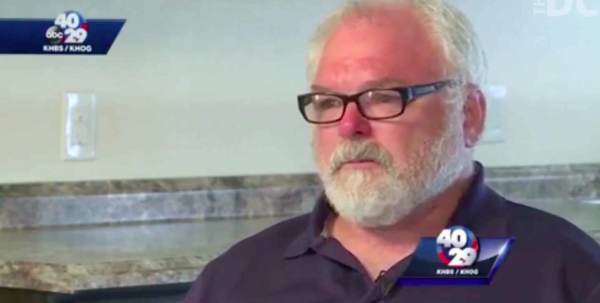 In an emotional interview, Texas church shooting hero, 55-year-old local plumber Stephen Willeford, broke his silence on the massacre. Stephen Willeford, who is described as a former NRA instructor, grabbed an AR-15 when he discovered a man was shooting up the church and ran to the scene to stop him. As The Gateway Pundit previously reported, Willeford managed to snipe a part of Kelley that was unprotected by the killer’s body armor. Willeford doesn’t have any military experience. Willeford was the “local member of the community,” who flagged down Johnnie Langendorff after the shooting. The two chased Kelley in Langendorff’s truck. As The Gateway Pundit previously reported, Johnnie Langendorff was driving by the scene of the Sutherland Springs Church shooting when he witnessed shooter Devin Patrick Kelley exchanging gunfire with another man. After Kelley fled the scene, Langendorff and the man chased after the killer in his truck. “The neighbor with the rifle came to my truck and he opened my door and said, “He shot up the church”, and got in, Langendorff told Good Morning America on Monday. “It seemed everybody had headed up to the church. I’m not sure if anybody really realized that he had left and gone that direction,” added Langendorf. After Kelley lost control of his vehicle, the man jumped out of Langendorf’s truck and pointed his rifle at the killer until police arrived on scene.